Backup your Microsoft® Outlook 2019, 2016, Office 365, 2013, 2010, 2007, 2003 or 2000 e-mails and settings regularly. Restore your data in case of need or transfer it from one computer to another. Windows 10 and Outlook 2019 compatible! 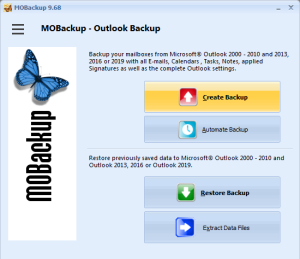 MOBackup - Data Backup for Outlook 2016, 2013, 2010, 2007, 2003 and 2000 is a backup solution for archiving of your E-mails, Calendar, Contacts, Notes, Rules, E-mail Accounts, Signatures, etc...as well as for the Favorites / Bookmarks of the browsers Internet Explorer, Edge, Firefox, Opera, Vivaldi, Google Chrome, Business Contact Manager Databases and the OneNote Notebooks. Do you use Microsoft Outlook? Do you manage your e-mail traffic, your dates and contacts with Microsoft Outlook? Have you ever made a data backup for the case of need? No? What happens, if your computer broke down and won't work anymore? Your data will then be lost. Don't give this situation a chance! Make regular backups of your sensitive e-mail data from Microsoft® Outlook and restore it to your system in case of need. Nothing's more annoying than lost data and contacts.